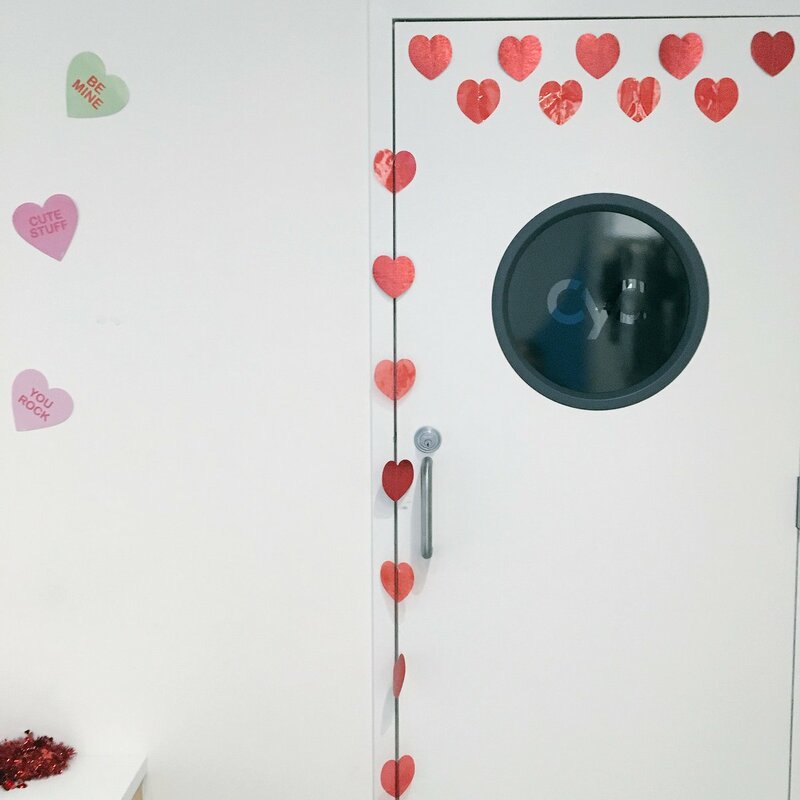 Friday night was when Jeff and I really celebrated V-Day, by doing our first date over again. I made reservations at Townsman awhile back and requested that we sit at the crudo bar (where we sat back in June) so it really was as close to the first date as we were going to get. And we even started with some of the same cocktails and menu items (charcuterie board complete with biscuits, plus deviled eggs). Later in the meal I enjoyed a delicious glass of Cremant. I love this glassware! 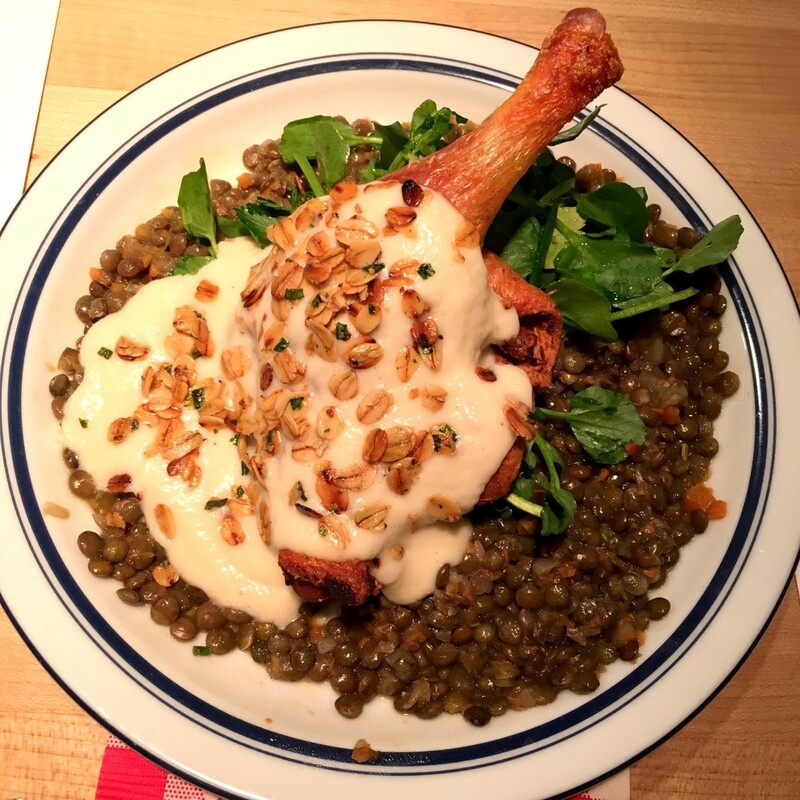 We also sampled some menu items we’d never tried before, like Brussels sprouts (for me) and duck leg with lentils (pictured below – tasted even better than it looks). 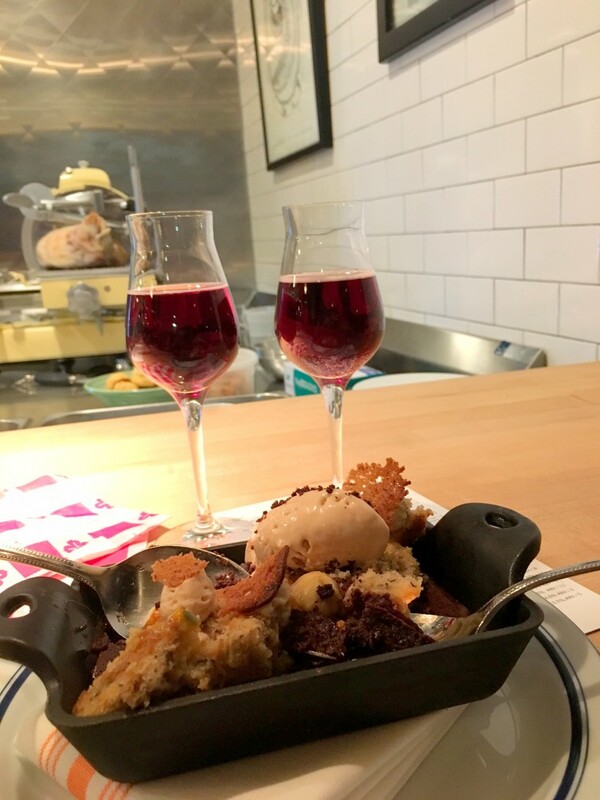 The restaurant was kind enough to surprise us with a complimentary dessert – complete with beverage pairing! We loved the chocolate, peanut butter, and banana flavors of this “ooey gooey cake”. The drink is called Brachetto and we both had never had it before, but it’s basically a slightly sweet sparkling red, similar to Lambrusco. The only reason I couldn’t finish dessert is because I wanted to stay awake enough to make it to the cigar bar! 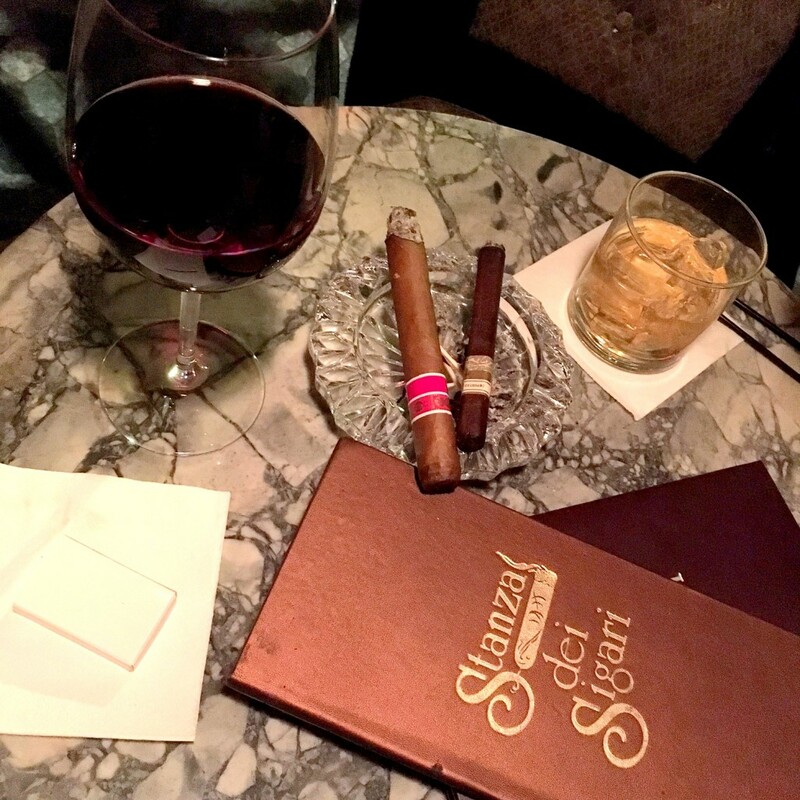 We found a cozy corner booth once we arrived and I had my favorite pick for cigar pairing, the Cigar Box Malbec. Jeff picked out a cigar for me and we relaxed and chatted until it was time to head home and hit the hay. I was glad we’d called it an early night because we both had to be at the Boston Wine Expo by 10am to set up and get ready for a long day of pouring wine at the 90+ Cellars booth, which I’d set up the day prior. Despite it being a pretty long day, by the time the shift ended at 5PM I felt like it had gone by quickly, since our booth was packed! I didn’t have nearly as much time as I did last year to walk around and explore, so I missed out on some fun activities like the photo booth, but I did manage to get my fill of cheese during a few breaks. 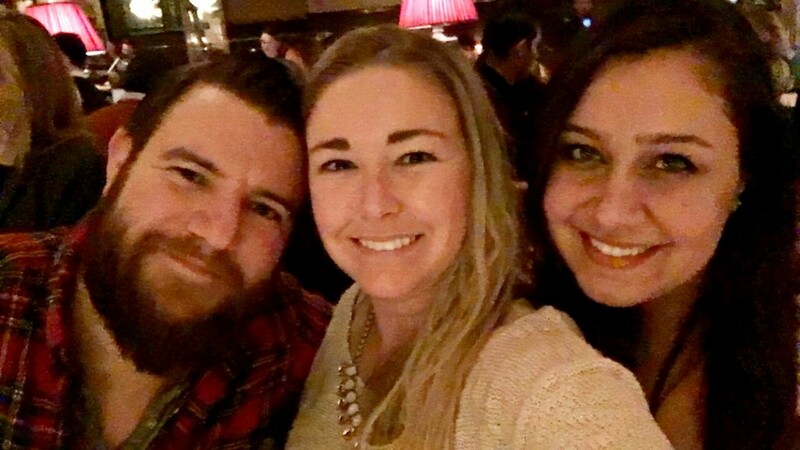 After the Expo Jeff, my coworker Cristen, and I rewarded ourselves with fantastic food/drink at Eastern Standard! Seeing as we started drinking when the Expo ended at 5PM, it was an early night for me and I was asleep by 10 or so. But that meant I got plenty of rest for an 11:30AM Cyc class on Sunday morning. I had taken the previous two days off from working out and was ready to get back into it. I definitely could feel the prior evening’s beverages but pushed through and felt so much better by the end of the 45 minute workout. Getting in the spirit at Cyc. I was sure to continue being productive when I got home. I showered, dried my hair, did my taxes, and got a big load of laundry done. Note that these are all inside things…any of my errands that involved walking outside were put off a day due to sub-zero temps. By 4PM or so I got stir-crazy and met Jeff over in Somerville at Aeronaut Brewing. He and I explored the aquarium last weekend and I wanted to keep taking advantage of free time by visiting more new-to-me places in Boston. I also long to find fun breweries like the ones I visited in Charlotte. Aeronaut was pretty good – no Charlotte brewery but I enjoyed the two beers I tried, A Session With Dr. Nandu (a session ale) and Orangutan Skies (an IPA). There’s no food at Aeronaut so bringing your own food in or having it delivered is allowed and, from the looks of it when I was there, a very common practice. I’d love to go back with a bigger group, bring a bunch of snacks, and hang out. The only downside is Aeronaut is located in a public transportation desert. Jeff and I met at the Harvard Square T stop and took an Uber to the brewery, which cost us about $10. I would have toughed it out and walked if the temps were normal, but…they weren’t. We eventually made our way over to Tavern Road, a really great spot in Fort Point, for their Valentine’s Day industry night. Since we are not actually in the industry we showed up right at 8PM on the dot, and got a cheesy VDay photo out of the way. Four Roses was the featured spirit of the night so I enjoyed that in a Manhattan, before switching to rose and then Notch Pilsner, one of my favorite beers lately. Unfortunately I had work on President’s Day so I couldn’t stay that late, and had to leave right around the start of the entertainment from a Prince cover band. A bummer, but better than showing up to work on Monday exhausted and hungover. How did you spend Valentine’s Day weekend?